Check Out These Tiny Packages! Home » Film » Check Out These Tiny Packages! Just as the short story trembles in the footprint of the novel, the short film plays David to feature-length film Goliaths. But with the help of shiny, naked bald men, these wee bits of cinematic splendor step from the shadows and sling their short shots. And in the 12 years I’ve had the pleasure of covering them, this year’s bunch is easily the best. Set in Africa, this short is proof that you can create pant-wetting tension, heart-splitting tragedy and soul-filling redemption in less than 30 minutes flat. Crespo creates a nuanced, minimalist story revealing the hellish world of child soldiers and the limitless potential of the human spirit for forgiveness and rebirth. So, yeah…check the on your ballot now and thank me later. If somehow That Wasn’t Me doesn’t win, it will be because Oscar voters couldn’t pass over a film about a boy dying of cancer and a kindly hospital worker who invents heaven. It may be a bit cloying and cliched with its heart-string puppetry, but the fantasy sequences alone elevate the material beyond Lifetime TV-style limits. Audiences will be split into two camps: those who say they got misty eyed and liars. Legrand’s film is basically a heist movie. Money is transferred into accounts and cons are underway. But the “treasure” stolen here is freedom from domestic violence. A woman seeking to save herself and her children asks for help escaping her abuser from her job. Her boss fires her instead of letting her resign, so she gets severance, her coworkers lie to cover for her…but then her husband shows up. It delivers unreal tension in just under 30 minutes. Related: I can apparently hold my breath for just under 30 minutes. The lone dud among the 10 live-action and animated shorts, this slightly goofy comedy is eight minutes of a family rushing to a wedding. People fall down and wear silly clothes, if you’re into that. I can only hope some form of nepotism got this a nod because I don’t get it. Oof. If one film from this bunch is developed into a feature, it should be this. Starring Martin Freeman as a psychiatrist interviewing Tom Hollander playing a man who claims to be God, this has at least 2 “holy eff” moments and the coolest ending of the bunch. That Wasn’t Me was the “best” short of the year, but The Voorman Problem was my favorite. Nominating any Disney animation feels obvious and obligatory. But Get a Horse is a delightful madcap romp that brings a classic version of Mickey Mouse back on the screen. Little more than a series of cartoon character slapstick sight gags, it’s a throwback that still has a bit of pep in its step, even if it has nothing to say. This gorgeous endeavor feels like a moving painting. Following a wild boy who is brought to a school to be civilized, the short reminds us that the savagery of the animals is outdone by the beastly nature of “society.” It’s the most visually arresting film of the bunch, even if its theme is as old as Tarzan. This faux clay-mation special is pure kids’ stuff, which is surprisingly refreshing. The whimsical narration provided by Simon Pegg advances a delightful morality tale about acceptance, collaboration and the power of the dark arts. Parents may not be wild about that last part, but it’s a lot of fun. Possessions is a three-dimensional, computer-generated version of hand-drawn Japanese anime, infused with the spirit of Hayao Miyazaki. Umbrellas and tapestries come to life and “attack” a wayward soul who defeats them by repairing them. It’s as silly and delightful as it is lush and vibrant. It’s the epitome of why I love animated shorts…and it’s not even the best one. I watched Mr. Hublot twice in a row. I love it. I want it made into a full-length feature, and I would buy the inevitable associated toy line. A fusty robot with OCD is transformed when he adopts a growing robo-pup. 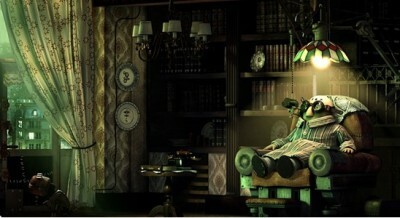 This gem is part steampunk visuals and part E.T. sci-fi tear-jerking. Get a Horse will take home Oscar gold (ugh), but Mr. Hublot stole my heart.